I have developed special tours catered to both Israeli companies hosting guests from overseas, and to foreign companies with staff in Israel. I understand that time is money, and I have created special short tours for business guests with highlights of the main tourist attractions in Jerusalem. 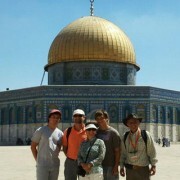 One square kilometer, four quarters, three religions and all the history in the world. We can have a two hours, four hours, or a full day walking tour, with or without a car. I have guided foreign government ministers, army highest ranking personnel, Hollywood stars, CEO’s of top international corporations, diplomats, world renowned professionals. and more. I am proud of what I do, and for me – everyone is a VIP!